Ever wonder what the best owners, managers, and employees do on a weekly basis? The mystery is about to be over: Drawing from our 15 years of small business development work with thousands of businesses, MasterPlan™ comes preloaded with best practices – anchor activities, as needed’s, projects and to-do’s for a variety of different job functions. You can easily edit and modify them to suit your needs. MasterPlan™ is designed to be easy. Instead of having to download, install, maintain, and upgrade software, MasterPlan™ is a web-based application. That means you can use it from any computer, running any operating system, from any location in the world with internet access. That goes for web-enabled phones too! Every user is given a username and password that lets them access their MasterPlan™. Upon logging in, the user is given a single “day” view option that lets them easily see what’s on the schedule for today, what project milestones are coming due in the next two weeks and what items need attention. There is also a seven day week view that gives even more detail about activities and your team’s performance. Using MasterPlan™ takes about 5-15 minutes per day. This time is spent checking things off the list, ensuring the right processes were followed and making sure the user is on track for the specified outcomes. We lose 2 hrs per day – Want it back? That’s right a study by Salary.com and America Online concluded that the average worker in America wastes almost 2.1 hrs per day. With MasterPlan™ we’re determined to help you get most if not all of that wasted time back – turning a daily loss into productivity that can help your business grow and thrive. What about monitoring my team’s performance? Simple. 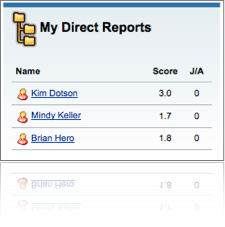 Your direct reports are conveniently shown on your dashboard. You can see their real-time score or if you want to see the details of what they’re getting done, you can dive right into their MasterPlan. 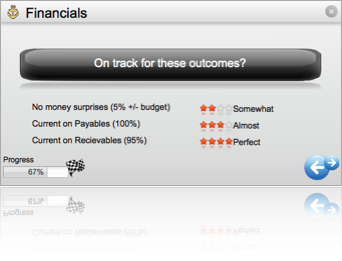 You can see historic performance, record coaching notes, enter formal reviews and even look at their direct reports.